They spend their days building other people’s dream homes—but if they had their choice, which of their creations could they see themselves living in? We asked some OHBA member builders and renovators, who have crafted some memorable and award-winning houses, for their picks on the residences they’d be happiest to inhabit. 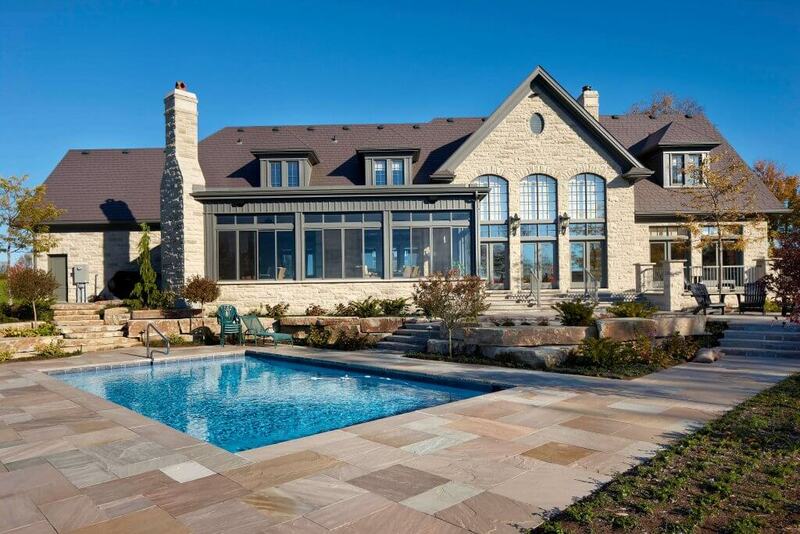 While, at 4,000 square feet, it’s much bigger than he and his wife Marilyn require, Steve Snider would feel right at home in the custom waterfront French chateau he built for a client on Scugog Island near Port Perry. The R2000 house, constructed in 2012, was a CHBA award finalist. First of all, the land reminds Snider of his own Scugog Township farm property (one of its owners actually chose the site because it reminded her of her native Scotland.) The striking creation is hidden from the road and a tree-lined drive leads through rolling landscape to its lakeside location. “The house has lots of detail and it’s built the way I’d build my own place,” says Snider, with features such as insulated concrete form (ICF) construction, a geothermal system and radiant in-floor heating, and is totally maintenance-free. Snider appreciates that its affluent owners didn’t go over the top and that comfort wasn’t sacrificed. He believes in homes that are built to suit their inhabitants’ lifestyles, not to be showplaces, and says this is a prime example. It’s designed for family gathering and socializing, with an open-concept kitchen, living room with soaring ceilings and two-storey fieldstone fireplace and lots of triple-glazed windows to take in the lake views. It also features a huge screened porch with a fireplace and a beautiful pool for indoor-outdoor enjoyment. The favourite part of the project for Snider and his trades was moving and restoring an original 16’ x 21’ log cabin on the property, set between the main house and the lake. It included adding a front porch, a fieldstone fireplace and a sleeping loft. “I could live there,” says Snider. With more than 200 projects under their belts, renovators Brendan Charters and Jim Cunningham, owners of Eurodale Developments, had a tough time choosing which one they’d like to live in—and each had a different preference. For Charters, it’s a renovation on a house they dubbed ‘Georgia Peach’, set in Hoggs Hollow, a tiny pocket of land at Yonge Street and York Mills in north Toronto. A previous house flipper ruined the original facade of the stately Georgian-styled home by cladding it with stucco, and in 2014, Eurodale’s task was to restore it to its former glory and add some unique architectural features. Originally, the plan was to strip the stucco and clean and rehabilitate the old brick, but the flipper had shot nails into the bricks’ faces, shattering them. Thankfully due to advancements in thin brick and stone veneer, Eurodale was able to achieve the intended vision. The home’s curb appeal, though, was lacking relative to its location and quality of the interior space. New false dormers with real windows and lights were added to give it the look and feel of a much larger space. The new facade and the midtown location are what speak to Charters. He appreciates that the clients gave Eurodale free rein on the design that dramatically increased the home’s aesthetic and resale value, without altering its footprint or interior. A midtown location also resounds with Cunningham, but his choice is a single detached transitional home that he and Charters renovated on Kelso Avenue in the Avenue Road/Lawrence Avenue corridor, within walking distance of numerous amenities and close to the 401 and public transit. “The house design was influenced by our taste, with a layout centred around entertaining,” says Cunningham. “It was an entertainer’s dream, from the large rear deck to the butler’s kitchen.” The challenge was working within the existing footprint of the home—when the job was finished, to the untrained eye, it appeared to be a completely new house. Cunningham is also proud that the home was future-proofed against rising energy costs. While this hybrid timber-frame house built in 2003 has plenty of appeal on its own merit, its stunning location, vistas and its orientation to maximize the views from a unique piece of land on Kasshabog Lake is the big attraction for Scott Wootton, owner of Kawartha Lakes Construction. 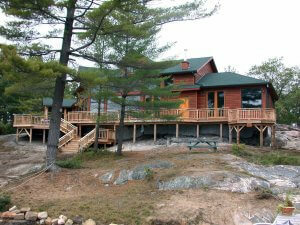 When it was built, the Peterborough County home represented the best of the best in building methods and features. It was a registered R2000 home with a tight .8 ACH (air changes per hour), as well as ICF foundation, smart framing with super-insulated R27 walls and R51 vaulted ceilings, radiant in-floor heating, a gas boiler and a tankless water heater supplying on-demand hot water. It boasted Lutron smart wiring and an entertainment area with built-in dual plasma screen TVs and an additional drop-down 10-foot projection screen for movies. The kitchen was kitted out with high-end Wolf and Sub-Zero stainless steel appliances, and Corian and concrete countertops. “Fifteen years later, it’s amazing how many of its features are now either run-of-the mill or redundant technologies,” notes Wootton. Still, the house was full of fun and unique custom features that have stood the test of time. Those include the second-storey glass-floor catwalk with curved custom railings, a two-storey fireplace and built-in features including sitting areas, screened rooms, multi-level decks and structured wire sound system. It has a killer man cave garage, with epoxy floors and custom cabinets. Tempted as they might be, most builders would pick their own homes as the ones they’d most like to live in. Dave Brix, president of Guelph-based Terra View Homes, is no exception. But we have to admit that his abode (on the cover) is pretty unique. Brix designed and built the Waterloo region house for family living. It’s contemporary in style with a wide open plan that includes a yoga room and in-law suite with barrier-free entry. The suite is part of a separate wing on the main floor. The house is ICF-constructed from floor to roof and is slab-on-grade, with hydronics throughout. Brix built the house in response to changing climatic conditions so it would be ‘bomb-proof’ in case of severe weather events. The roof trusses are hurricane-strapped to the ICF walls, with a standing seam steel roof. He’s future-proofed it against rising energy costs with a 10 kW solar array and south-facing wall that’s almost entirely glass. However, large overhangs shade against summer sun but allow it to penetrate deep into the house when the winter sun is low, with the large thermal mass and black-tiled floors providing passive heating. A clear storey of remote-operated windows on the rear of a three-storey space takes advantage of the natural stack effect to cool the house during warm weather. Any child would covet his kids’ bedrooms. They are two-storey spaces with lofts to provide private living spaces and each room’s entrance is hidden behind aluminum bookcase doors, operated by moving one of the books in the door. “It’s a great home to live in and is extremely bright, with incredible views over the pool and river in the rear yard,” says Brix. Sounds like a home we’d like to live in too! 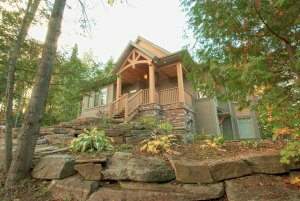 Hunt’s design was inspired by traditional Muskoka and Kawartha-area cottages and boathouses. However, it departs from tradition with the use of expansive glazing to allow for multiple vistas from its location on a point. Wood siding and stone, a post-and-beam timber main entrance and warm, earth colours allow it to blend into the natural landscape. Inside, the interiors are similarly warm, anchored by a dark hardwood floor that’s contrasted by a lofted pine finished ceiling. Solid pine hammer beams accentuate the space, helping to define and animate it. Marshall particularly appreciates the kitchen, designed by Randy Albert of AYA Kitchens, and how it ties the lifestyle to cooking, with an open layout so the chef can still socialize while preparing meals. He also has a sentimental attachment to Crystal Lake, where it’s located. While it’s currently the most coveted of his creations, Marshall says he may have another soon: “We are building (Cassidy & Co. architectural technology company owner) Wayne Cassidy’s cottage now, so you may have to ask me again next year about my favourite.